Review: Ghosts, witchcraft and vampires galore! This book, as you can probably guess, is about creepy things. It's called That's Creepy! by Crispin Boyer. It's a book about the weird, creepy, unexplainable things that are being discovered. Take ghosts. There's the legless lord, who is seen in a photo, even though he's being buried only a few miles away. You'll also see the specter of the Scottish castle, whose picture was taken for a creepiest phantom picture. Vampires are some of the most famous of monsters. Take the classic, Dracula. Some people, when they are afraid of vampires attacking them, they will dig up graves of so-called ÒvampiresÓ and found blood oozing from their bodies. When they saw that, they would drive stakes into their bodies. But in reality, when a body decays, it will ooze out all of its fluids. Another big topic was witchcraft. Witchcraft was a really big thing back then because they believed that witches were really demons in disguise. Eventually it stopped, but people still have fun dressing up like witches on Halloween. 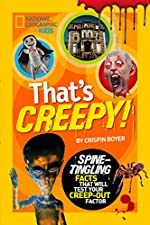 I loved That's Creepy; it's a great book for Halloween and a book that I would think is one of those books that you almost can never put down since it has a lot of great stories about all the spooky sightings around the world. I liked reading about the supernatural ghosts and how the different roles they play in stories. I would recommend this book to 7 year olds to teenagers, and anybody who likes to read a good scare!